The house's connection with Greece derives from a possession of Gabrielle Chanel's 1st-century ceramic of Venus to be found in her apartment on Rue Cambon. Furthermore, she served as costume designer for a 1922 play by Jean Cocteau, a then-modern reinterpretation of Sophocles' Antigone. Considering Greece's current financial predicament, it might strike one as peculiar that Lagerfeld would glamourise something problematic. Greece isn't all Sophocles, Acropolis (the large set that counted for the show space was modelled on the ancient citadel), exotic islands and the birth of the Olympic Games. Economic turmoil was triggered by the Great Recession, resulting in inability to repay debt; tax increases caused local riots and nationwide protests. Inevitable action was taken by European banks and governments. There is a bailout that will exceed €180 billion once the next loans are issued, on May 18. Economics isn't Lagerfeld's preoccupation--we learned this with his Cuba excursion, where a multi-billion dollar conglomerate arrived in a country where the average income is $3,000. Instead it is image Lagerfeld searches for, a tangible sense of place. "Reality is of no interest to me. I use what I like. My Greece is an idea," Lagerfeld said to Alexander Fury, chief fashion correspondent to T Magazine: The New York Times Style. It's a perfect example of post-truth (described by the Oxford English Dictionary as "relating to or denoting circumstances in which objective facts are less influential in shaping public opinion than appeals to emotion and personal belief"), the world we live in. It refers to the process of design too. It's likely that Lagerfeld didn't visit Athens to accumulate Hellenic references to build his collection, but rather a quick Google search, a film screening or two. It isn't about economic turmoil but the dreams and perceptions we hold onto—a classic case of manipulating appearance and reality. The show was marked by vitality, effervescence and refreshment, three terms Chanel often desists from attracting. There is often a depression with the brand's creative output, where everything slumps and it's energy is wholly depleted before Lagerfeld's wizardry whips together a dynamic lineup of clothes. This was one of those collections, where it appeared an injection of zest didn't go amiss. 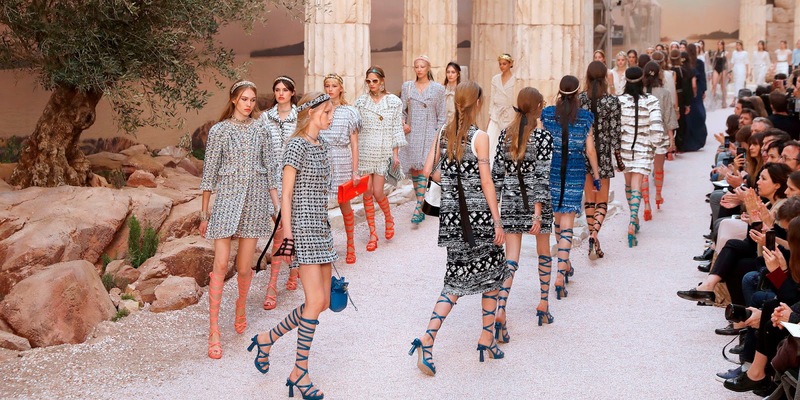 There were abbreviated dresses, traditional emblems of Greek culture given the regal Chanel treatment. Every stereotype under the sun was considered: the decadent, fearsome warrior; the gold-clad goddesses; the soigné noblewomen. It oozed modernity for once. The moderately interesting gladiator sandals were engaging but it was the short party dresses that whisked me off my feet. They bore a lightness and effortlessness that symbolised an unsheathing of formality, an awakening of suppleness. The finale gown was a portrait of Aphrodite, a one-shouldered gown with intricately detailed sequin work on the waistband. Much fabled Greek mythology inspires endlessly. It is an appropriate influence that allegorically paints an image of both Chanel's status and the system of cruise/resort presentations. Greek gods are considered to be divine, the archetypal characters of their respective fields: god of the sky, goddess of love; they are higher beings with incredible powers. 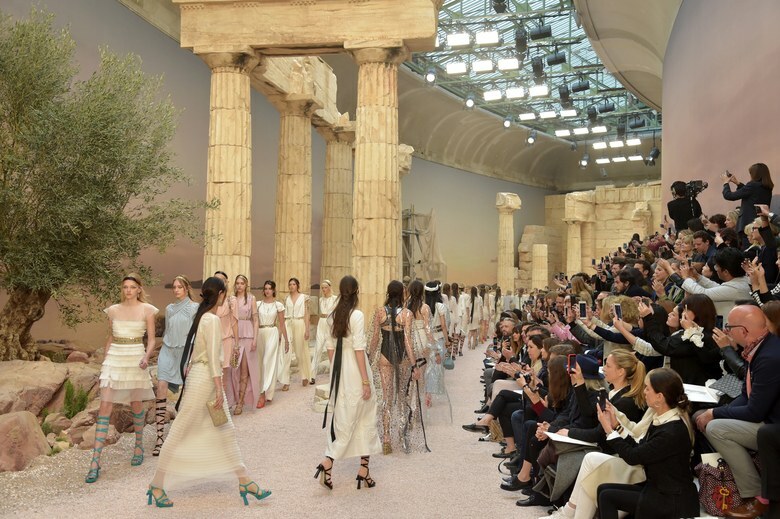 The scale of this presentation is indicative of Chanel's power as a fashion house and their ability to have fifty craftspeople spend four weeks constructing an Acropolis in the Grand Palais and transport hundreds of press figures to the show, free of charge. This idea of power and might extends to the entire pre-collection system in that it is all about flexing a business muscle, effectively shouting in the audience's faces that their revenue soars into skies of billions, which inevitably showers on and fertilises their creative endeavours. It allows Karl Lagerfeld, or anyone other designer with myriad possibilities thanks to money, to conceptualise projects such as this, repeatedly, and bear the same dreamy impact with every elaborate production. This season, Greece is the word... it also bears groove and feeling, it's a time, place, motion, the way we are feeling. Lagerfeld operates in a literal space, there are direct meanings, but his fashion design surprisingly offers something else, something deeper to ponder. And this season it also had groove and feeling.